Pay off debt or save money? The age-old question. It’s also a bit of a conundrum. You need to save an emergency fund to break the debt cycle. An emergency fund is essential to make sure you don’t get into debt when life happens (which it always does). It’s not surprising to hear that most people who struggle with debt, don’t have an emergency fund. Often, the difference between getting into further debt or taking an emergency in your stride is having money in the bank. So how do you build an emergency fund when you’re in debt? And should you even bother? Should debt payoff be your primary goal? The short answer is yes and yes! Yes, you should bother saving money for an emergency and yes, debt payoff should be your priority. Now I totally get that there are many schools of thought on the best first step to take towards financial freedom. Many say you should clear debt before starting to save money, due to the limited financial benefit of interest earnings compared to what you pay in interest on a credit card or personal loan. Others believe you should build an emergency fund whilst making extra repayments towards your debt. I’m in this camp. You can do both! When I started the torturous journey of paying off my consumer debt I knew I needed a quick win because the slog of paying back debt sucked, big time! I figured having some funds in savings for the first time in my life would be sufficient reward for the suckiness of having to work four jobs to pay off my loans. On my weekly pilgrimage to the bank to pay my credit card balance in cash I would also make a small deposit into a high-interest savings account. Now, I mean small. $10 to be exact. At the time I didn’t have a savings goal, I just wanted to put something in the black column to counter all the red. It was months before I even felt like I’d achieved anything. As the balance of my debt started to dwindle I was able to contribute extra to my savings account. $20 here, $35 there. I started to make rules for my money. Like everything I earned from babysitting jobs would go straight into savings. Once I’d paid off one loan I was able to increase my weekly savings deposit to $20 whilst reallocating the remaining funds to the debt repayments. Even though I knew the effective interest rate earned on my savings was nothing compared to what I was paying in personal loan interest, I needed that growing savings balance for my own peace of mind. Often debt payoff is the all-consuming priority. When debt is paid there is an unbelievable feeling of freedom and achievement which can be overwhelming. Like making-you-want-to-spend-a-shitload-of-cash overwhelming. For me, already having the savings habit instilled whilst I was paying down debt meant that once I was in the clear I could immediately switch my focus to building my savings account. I instantly redirected the debt repayment amounts into my savings account and added more when I could. It’s scalable. Once you’ve saved $1000 you can save $2000, $5000, your house deposit. The systems are in place. You’ll get better and better at being a money-saving machine. It’s achievable – anyone can save $1000. Even on the minimum wage, I guarantee you could find between $2-$10 per week and save $1000 within a few years. It feels like a lot of money (and it is). That means your achievement meter will be sky-high, keeping you motivated. When I finally had $1000 in my savings account I felt invincible. It was the not-so-quick win I needed. After that, I was able to use my new-found savings habits to save with purpose and eventually upped my savings account balance to $10,000 – enough to go backpacking around Europe for two months. Since then I have become a master saver. For years before becoming parents, my husband and I saved over 50% of our take-home income which has allowed us to travel extensively whilst purchasing a portfolio of investment properties. We are well on the way to real wealth, and it all started with $10 per week. Whilst there are many ways to save cash its harder when you are also paying down debt. Every spare cent should be given a job. Whether it’s debt repayment or savings. You could choose to allocate 90% of extras towards debt and 10% to savings, whatever works for you. Here’s what I did. I became very accustomed to my daily coffee and raisin toast breakfast at the office. I cut the raisin toast from my morning routine saving $1.30 per day or $6.50 over a working week. I know I should have given up my coffee as well but I’d rather die than live without coffee. This sounds so obvious and yet I wasn’t doing it. That’s the reason I was in debt in the first place. I spent whatever I wanted. Which meant lots of sushi and Thai food. Meal planning saved a lot of money, I’d estimate around $30-50 per week. There are tons of other ways to slash your food bill including eating less meat and repeating your meal plan frequently so you can buy your groceries in bulk to save money. This wasn’t an option for me as I was living in a fully-furnished house so I didn’t have much to sell but if you are surrounded by clutter and in debt up to your eyeballs it can be a great way to clear some bills and clear your space. I wasn’t disciplined enough to keep my savings in the same account as my everyday funds. Opening a separate account was the only way for me. I started with a savings account with the same bank and as I became more interested in making my money work for me I opened a high-interest saver with a completely different online bank. This meant it would take over 24 hours to access the funds – enough time to decide if that purse I wanted was a want or a need. Adding a savings category to your budget means you are paying yourself first and will ensure it actually happens. This was the single best way for me to repay debt and build savings. At one point I was working four jobs – my nine to five office job, in a music store on weekends, occasional bar work for concerts and babysitting for friends and colleagues. While I still had debt around 90% of my extra earnings went to debt repayments and 10% to savings. Once I’d cleared my debt I funnelled all those funds into savings. These days there are so many ways to earn extra cash from home which you can use to build up your savings fund. There are websites that pay you cash to take surveys, play games, share your opinion and more. Plus, check out this list of sites that’ll pay you just for signing up! I believe learning how to save money is the most important financial skill one can learn. Once you know how to save you can build an emergency fund to avoid getting into further debt and start to build funds for future investment. You can save for a deposit on a home or even save a big stash of cash just for travel! I’m really glad I didn’t wait until I’d cleared my debt to start saving money as I believe the two skills are complementary. In response to the age-old question – pay off debt or start saving? I say do both. With a focus on eliminating debt. Your future self will thank you. These are all great tips! Selling your stuff can really help out, plus you most likely do not need everything you have anyways. Great stuff, Emma! Lovely to have stumbled upon your blog. 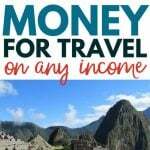 We travel a lot with our littlies too, so am enjoying your travel stuff as well as the money tips. I was excited to come upon this article because I very recently posted a pretty long article on my blog about getting you your first $1000. The info in this post is excellent. It’s very difficult BUT very important to get to your first $1000 – without some sort of cash cushion you are way too exposed to all of life’s uncertainties and all of life’s craziness. I’ve found that there are usually two reasons for why a person hasn’t yet accumulated their first $1000: either they don’t earn enough money OR they earn a reasonable amount but they overspend. 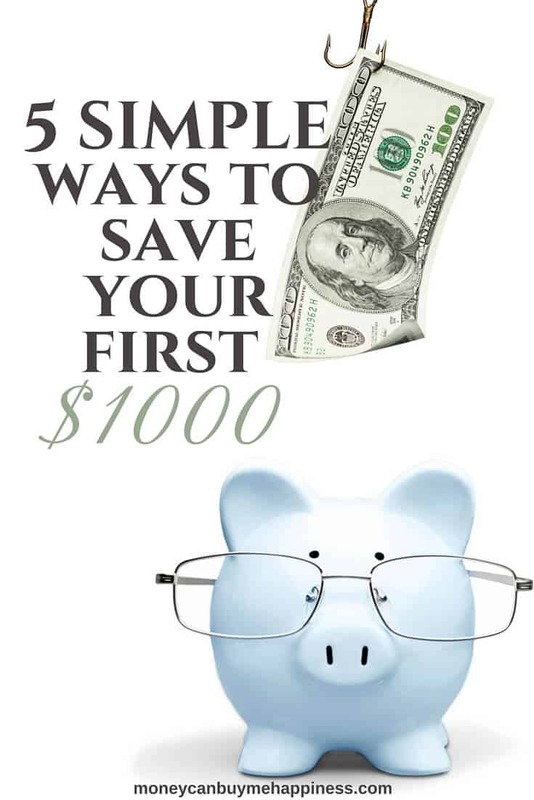 It’s almost impossible to even save $1000 if you are earning an extremely small income. Each of the two possibilities requires a specific approach. Great advice. $1,000 is a good amount to aim for to begin with. Seeing $1k in the bank is so motivating, especially if you’ve been struggling with debt. I sold some of my stuff to help me hit my first $1,000 and it was surprising how quickly I found things to sell plus prices they went for. Absolutely. Being $1000 in the black felt so good after being thousands in the red for so long! great list – i already do , or know most of them but it’s ALWAYS good to have an organized check list to work from – always trying to find extra ways to make cash – especially now that I’m saving for an impending wedding – but even after that, I’d probably keep doing it – In some ways, I like ‘finding’ that dollar, especially when I can find it lying within something I love doing, like writing! The power of that first $1000 in savings (when you’ve never had any) has to be felt to be believed. Once you’ve achieved that, you can do anything! Right?!?! It’s so powerful having money to your name, when you’ve only ever known debt. Loved these tips Emma!!! I have student debt and I’m still actually in school for another 4 years or so….. so it will be much larger when I’m done however after looking at my budget, I realised I could at least put $85 a month on my tight student budget, however in 1 year that will be $1,020 and that doesn’t count any extra interest…. even if it’s only a few extra dollars in interest it’s free money either way! One thing I do while I’m in school is also throw money on my student loans even if it’s only $5 or $10 a week…. I think paying off debt even before you have to start paying it is also another good tip. Either way loved your tips because even little amounts can add up to $1,000!! Awesome work, Reio. Yes, small amounts do add up! Plus you’re way ahead of most students if you’re already paying down your student debt. The most important thing when it comes to debt is a positive attitude. I’m pretty sure you’ve got that sorted!